Come find out why we are known for our excellent nursing care! 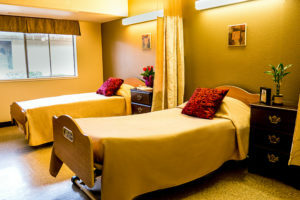 There is a difference in skilled nursing facilities. We truly believe that our difference is not just our caregivers and our positive ‘can-do’ attitude but includes our commitment to meet the needs of both our residents and their families, that is why, “We are Family Serving Families”. Capital Transitional Care provides both short-term rehabilitation and long-term care at the highest standards. We provide comprehensive skilled nursing care using state-of-the-art medical equipment and progressive treatment plans promoting quality care. We have registered nurses on duty 24 -hours a day, seven days a week. Our nurses have to meet standards set by the State of California’s Department of Health Services, Licensing and Certification for licensure. The charge nurses supervise a staff of certified assistants (CNA’s) who help patients with bathing, dressing, and meals. In addition, the CNAs take vital signs (i.e., blood pressure, temperature, and pulse) and report these to the charge nurse. Authorized family members may also call the charge nurse at any time for a status report on a patient’s medical condition. We are here to assist with the family’s concerns as well as the patients. In-house van available for resident’s outings with activities department, home visits, community integration trials and medical appointments. Contact us today to find out more about what Capital Transitional Care can do for you! Here at Capital Transitional Care’s therapy department our residents’ wellness and security are of paramount importance. Led by an Occupational Therapist, our therapy team has innovative approaches to wellness programs. Our department has been recognized by our company with an Innovation Award for our OT Cooking Group in 2007 and two Operational Excellence Awards, 1 in 2007 and one in 2010. We have the experience and the knowledge to provide the best possible positive outcomes for our residents at Capital Transitional Care. Our therapy team also won the 2013 Customer Experience Award, voted on by patient’s and resident’s satisfaction surveys, from Pinnacle Quality Insight. Our therapy team is very proud of the successes that our resident’s have made during their stay here at Capital Transitional Care. It is important to us that we highlight these successes because they help the resident truly understand how much functional Independence they have achieved from their date of admission to their date of discharge. We also like to share these success stories with the resident’s physician(s) and hospital discharge planner(s). This allows for a 360 degree approach to the care of our residents by providing the follow through, after discharge, to the original care providers. Our Homeward Bound program is focused on providing services to ensure that the patient safely transitions to a lower level of care. We have a facility van that is utilized for community re-entry activities. Our therapists are able to take the patient into realistic everyday activities that test them on challenges and obstacles that they may face once they are discharged and provide guidance, suggestions, and recommendations that are relevant to their individual situations. Our primary goal is always to improve the resident’s function to the highest level of independence possible. We have state of the art modalities that are the same utilized by many professional and college sports teams. We believe that our residents deserve the same million dollar quality of care that million dollar athletes receive. Two major concerns of the elderly population are incontinence and falls. Our therapy department is one of the few in the area that has a continence improvement and a fall management program to address these needs. Capital Transitional Care partners with Accelerated Care Plus (ACP) to provide continued education for our therapists on the most advanced therapeutic programs and equipment available. Our newest pieces of equipment are our two Omnicycles. The Omnicycle is an advanced therapy cycle that accommodates post-acute patients that would not normally be able to participate in therapeutic exercise. It has revolutionized the therapeutic process. We offer our resident’s every opportunity to be able to return home safely and at their highest functional level. We have established a transitional living unit (TLU) to simulate, as closely as possible, the resident’s upcoming home situation. Once a resident has been identified as an appropriate candidate for the TLU, the therapy team determines the functional tasks that the resident will be performing based on the requirements necessary for a safe discharge to a lower level of care. If the resident is successful in the TLU, the interdisciplinary team may confidently suggest a discharge home, knowing that they have done everything they can do to assure this resident’s safety. If however, it is determined that the resident needs further assistance in any of the areas required upon discharging home, the team will recommend that the resident remain in the facility a little longer and the focus of treatment will be specific to those areas. For patients on ventilation or with interstitial lung disease, cystic fibrosis, or COPD. Pulmonary rehabilitation is designed to improve pulmonary function and to teach management of respiratory symptoms during functional activities. Our 24 bed specialized Vent Unit is equipped with a state-of-the-art audio/visual/paging alert and alarm system to assist in identifying the exact location of the alarm and allow promptness in reaction to patients needs. 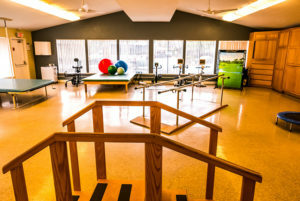 Our goal is to be your #1 choice for Ventilator and Pulmonary Rehabilitation and to help our residents achieve their highest possible level of function and independence. Bi-Weekly Visits by pulmonary group physicians and nurse practitioners for all vent unit patients. Multiple years of experience, specifically in the weaning of difficult to wean patients. 24 hour a day respiratory coverage, 7 days a week. Nursing to Patient Ratios to ensure more personalized attention for the needs of vent unit patients. Newest ventilators capable of providing Assist Control, SIMV with Pressure support, CPAP/PS, and noninvasive capabilities. Easy portability making it possible for patients to be taken out of room (very important in the weaning process). Multiple discipline approach to cover all areas of required needs for full recovery. Disciplines include; Physical, Occupational, and Speech Therapies. Respiratory Therapy and Nursing and Life Enrichment. Review and notation of supplemental oxygen requirements. Physiologic response to exercise and function. Breath control related to speech and swallow. Stress management and symptom management during function. It is these approaches that make the possibility of full recoveries a reality.